You will be given a reference e-book to read which has 159 pages And the test will be based on that e-book , you can take final test within 1 year of purchase. Leadership coaching refers to an effective and individualized process which works in building the capability of a leader to reach short-term and long-term organizational objectives. This type of coaching is usually customized and personalized and is mainly executed on a one on one basis for a specific period of time. One of the major advantages of this process is that it helps all types of leaders in enhancing their performance. It also works in growing and expanding the leadership bench of a business organization and helps all aspiring and existing leaders who wish to obtain a stronger and more competitive edge in the branding and self-marketing field. By undergoing this process, it will be easier for you to strengthen your knowledge and sharpen your skills as a future leader. A certified professional in leadership coaching normally performs his/her functions with the help of a wide range of methods and approaches. One of these is to use climate or anonymous surveys as a means of acquiring data that will be useful in identifying behaviors linked to the outcomes of a business organization. A leadership coach is also someone who has active listening skills. His responsibilities will include guiding his clients in solving their leadership problems. Leadership coaches will also be around to help clients in setting their priorities, anticipating and overcoming prospective obstacles, leading them out of their comfort zones, exploring newer options, setting goals and planning actions. If you are greatly interested about becoming a leadership coaching expert, then Brainmeasures, with its leadership coaching certification program can definitely work for you. This leadership coaching course from Brainmeasures allows you to understand how the whole leadership coaching process is exactly implemented so you will get an idea about how it works. This online certification program comes with a leadership coaching training which is extremely useful in your attempt to understand what the job of a leadership coach entails, the roles and responsibilities that you will be required to handle once you start working as a leadership coach, the different principles and approaches used in the implementation of the process, basics of dealing with different types of leaders and how you can help them become even more effective leaders. Your leadership coaching certificate is powerful enough that you can use it to acquire more clients who will pay you for your excellent services. How to effectively manage your fear and trust your intuitions? 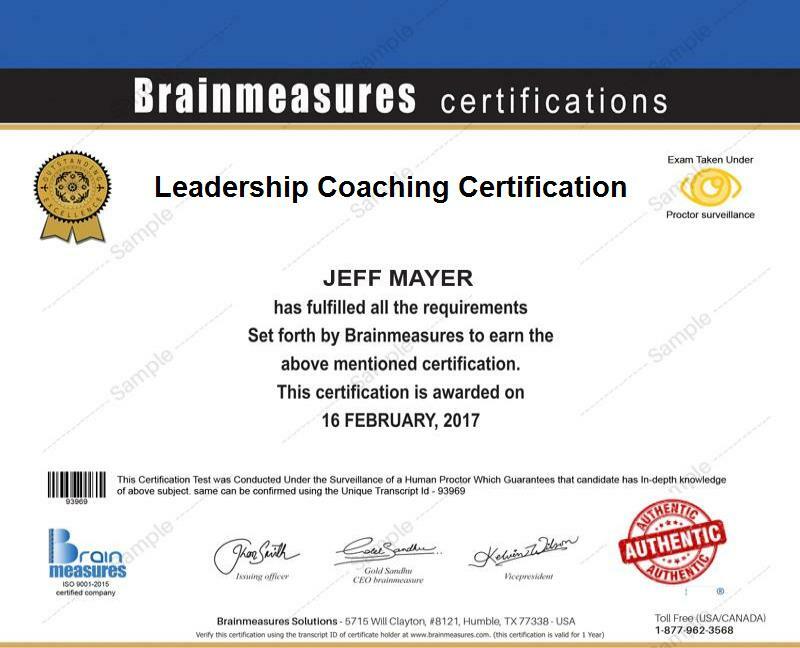 The leadership coaching certification program available at Brainmeasures is developed in a manner that it can work effectively for a lot of people. It mainly targets leadership coaches, consultants, organizational leaders, performance management professionals, human resource professionals and all other professionals who are in charge in leading a group of people to achieve success. Being a holder of a leadership coaching certification also entitles you to receive a higher pay. Using your certificate to work as a leadership development director gives you the opportunity to enjoy a more stable pay within the range of $58,000 to $114,000 every year. If you work as a certified leadership coach, then your salary can be expected to be approximately $62,000 to $139,000 yearly.